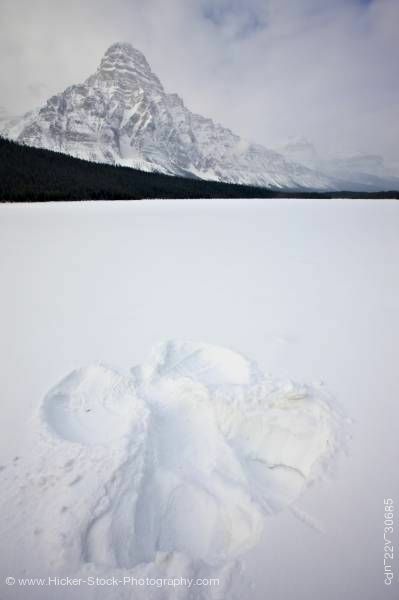 Stock photo of a snow angel made in fresh deep snow on top of Waterfowl Lake with Mount Chephren towering above in Banff National Park in the Canadian Rocky Mountains, Alberta, Canada. This stock photo includes a snow angel on Waterfowl Lake after fresh snowfall during winter with Mount Chephren (3307 metres/10850 feet) towering above, Icefields Parkway, Banff National Park, Canadian Rocky Mountains, Alberta, Canada. Banff National Park forms part of the Canadian Rocky Mountain Parks UNESCO World Heritage Site. Located in southwestern Alberta the eastern slopes of the Rocky Mountains, Banff occupies 2,564 square miles (6,641 square km). It is adjacent to Yoho and Kootenay national parks and south of Jasper National Park. Noted for its beauty, plant and animal diversity, and ongoing geologic processes, Banff was designated part of the Canadian Rocky Mountain Parks World Heritage site in 1984.